Take Highway 6 south. Highway 6 becomes Albert St. Turn left onto Victoria Ave. Proceed to St John St. Turn left onto St John St and go 2 1/2 blocks. The Church is on the left. Take Highway 6 north. Highway 6 becomes Albert St. Turn right onto Victoria Ave. Proceed to St John St. Turn left onto St John St and go 2 1/2 blocks. The Church is on the left. Take Highway 1 west. Highway 1 becomes Victoria Ave. Proceed to St John St. Turn right onto St John St and go 2 1/2 blocks. The Church is on the left. Take Highway 1 east. Turn north off Ring Road (Highway 1) at Albert St. Proceed north to Albert St. Turn right on Victoria Ave. Proceed to St John St. Turn left on St John St and go 2 1/2 blocks. The Church is on the left. 5:00 PM Vespers / Confessions. 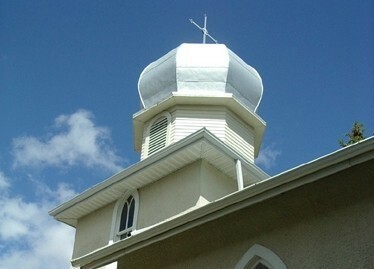 9:00 AM Matins; 10:00 AM Divine Liturgy, followed by Fellowship (Agapa crestina). For information about other services, please phone the church office at 352-5935.